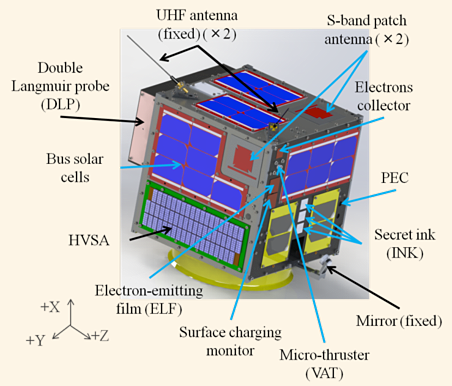 Horyu-4 is a small technology demonstration satellite built by the Kyushu Institute of Technology. It is also known as AEGIS – Arc Event Generator and Investigation Satellite, and will demonstrate a number of space systems and conduct technological experiments. 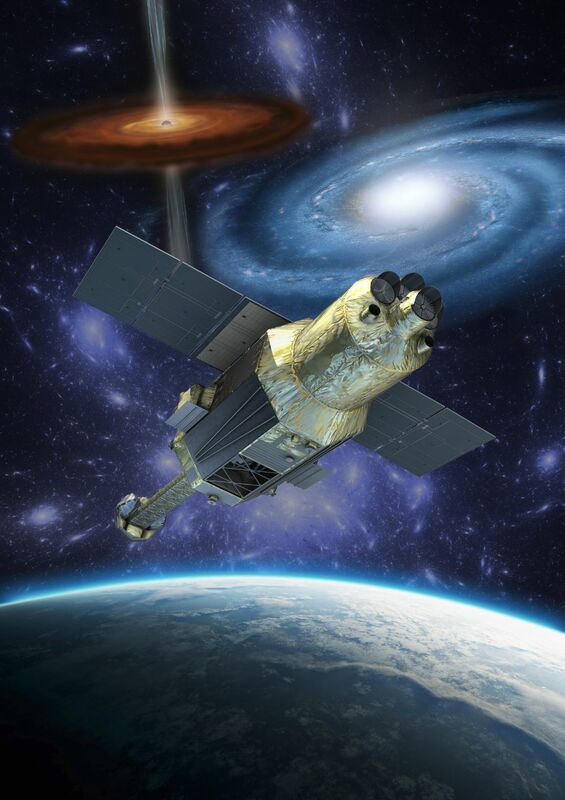 The objectives of the Horyu 4 mission are to acquire current waveform data of arcing phenomena on high-voltage solar arrays, imaging said phenomena, provide data on spacecraft charging and to deliver data for the development of future high-voltage space systems. 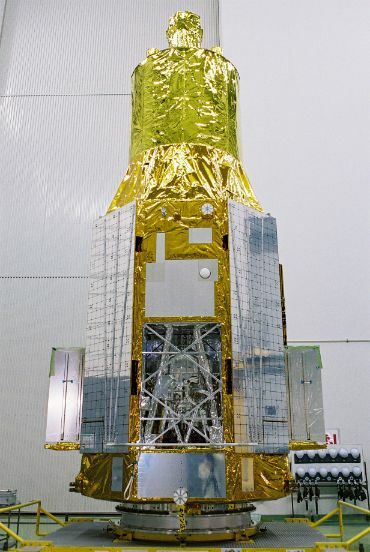 The Horyu-4 satellite has a launch mass of 10 Kilograms and measures 43.4 by 31.3 by 42.9 centimeters in size. Power generation is accomplished with 34 triple-junction solar cells installed on the external panels of the satellites to deliver an average power of 5.2 Watts, peaking at 9W. Three parallel sets of six Nickel-Metal Hydrate batteries can store 5.7 Amp-hours of electrical power delivered to the various satellite systems using a 7-Volt power bus. 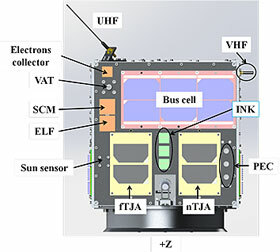 The Attitude Determination System of the Horyu-4 satellite is comprised of six sun sensors, one on each side panel of the satellite, one GPS system with two antennas and a package of two three-axis gyroscopes. Attitude stabilization is accomplished using one permanent magnet and one hysteresis damper. A central onboard computer features three microprocessors to control all the satellite’s functions including command execution, data handling and downlink. Communications are accomplished at different frequencies – one S-Band transmitter operating at 2.3 GHz is used for the downlink of payload data, two UHF transmitters at 437 MHz deliver spacecraft telemetry, one VHF receiver operating at the amateur frequency of 145MHz, and one L-Band receiver operating at 1.2 GHz. In nominal mission operations, the S-Band system is used to deliver mission and telemetry data at 100kbps. The UHF system is used as a backup and reaches data rates of 1,200 bps and 9,600 bps. Command uplink is done through the VHF system with the L-band patch antenna serving as a backup. Horyu-4 is outfitted with ten mission payloads and experiments. 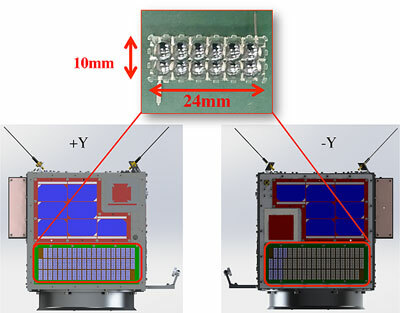 The primary objective of the mission is the demonstration of High-Voltage Solar Arrays that operate at 300 V. Two arrays of 24 by 10-millimeter solar cells are installed on the +Y and -Y faces of the satellite. Because of the higher potential difference between the solar array surface and the surrounding plasma mitigation techniques are required to avoid inadvertent discharges. 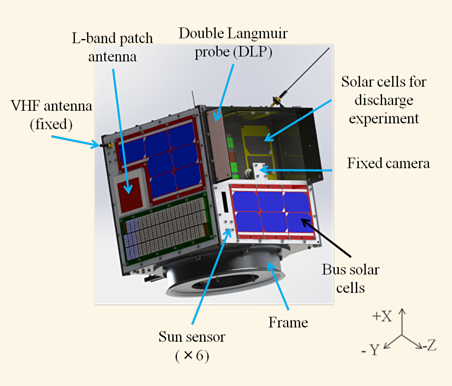 An onboard oscilloscope and an arc vision camera will be used to acquire the current waveform and images of arcing phenomena occurring on the solar arrays, a feat never attempted on a space mission before. Another power-system experiment installed on Horyu-4 aims to evaluate the degradation of filmed and coated triple-junction solar cells. 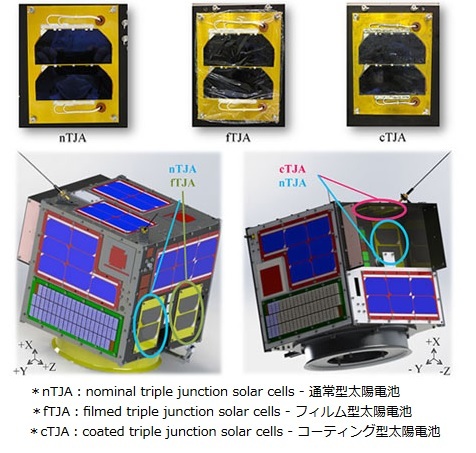 Attached to the satellite side panels are nominal triple junction solar cells, filmed cells and coated cells. Their power output will be monitored over an extended period of time to track degradation of the cells for a comparison. 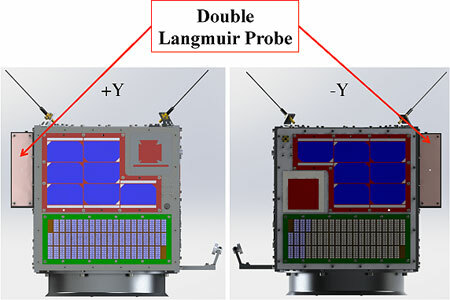 To measure the density and temperature of the plasma the satellite flies through, Horyu-4 is outfitted with Double Langmuir Probes. Langmuir probes can determine electron temperature, electron densities and the electric potential of a plasma. Two electrodes are inserted into a plasma environment. The electrodes have a constant or time-varying electric potential between them to allow the determination of physical plasma properties by measuring currents and potentials in this two-electrode system. A bias voltage is applied to the probe and the resulting current that is measured is proportional to plasma charge density. Installed on the +Z side of the satellite is a vacuum arc thruster interfacing with the 300-Volt solar array to complete a demonstration of a trigger-less vacuum arc thruster. The Vacuum Arc Thruster is a method of Electrical Propulsion in which an electric arc is generated to ignite a propellant source so that charged particles are liberated which can then be accelerated in an electric field and expelled to generate an impulse bit. Power is delivered to the thruster directly from the High-Voltage Solar Array. The thruster consists of an anode-cathode pair, a condenser and insulator. The condenser is directly charged from the solar array and the cathode material, carbon fiber reinforced plastic, is used as propellant. 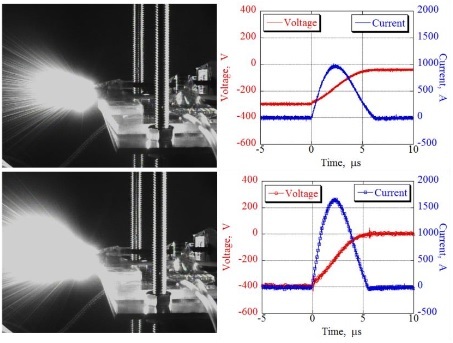 The interaction of the cathode material with the surrounding plasma allows even small discharges to trigger the vacuum arc which burns away some of the cathode material to generate thrust. The thruster head is 13 millimeters in diameter and 21 millimeters long with a mass of 15 grams. It achieves a specific impulse of 1200 seconds and delivers an impulse bit of 2 micronewton-seconds per discharge to generate an angular velocity change of 50 micro-degrees per second per discharge. A re-charge time of 20 minutes is required in between each discharge. The efficiency of the thruster will be measured with the onboard gyro of the satellite. A number of surface charging mitigation technologies are part of the Horyu-4 satellite payload. 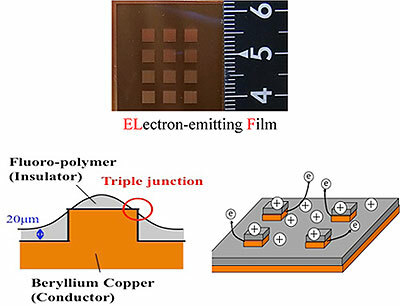 An Electron-Emitting Film consisting of a 20-micrometer fluoro-polymer insulation film applied to the high-voltage solar cells. The film can emit electrons to avoid an excessive surface charging on the satellite. 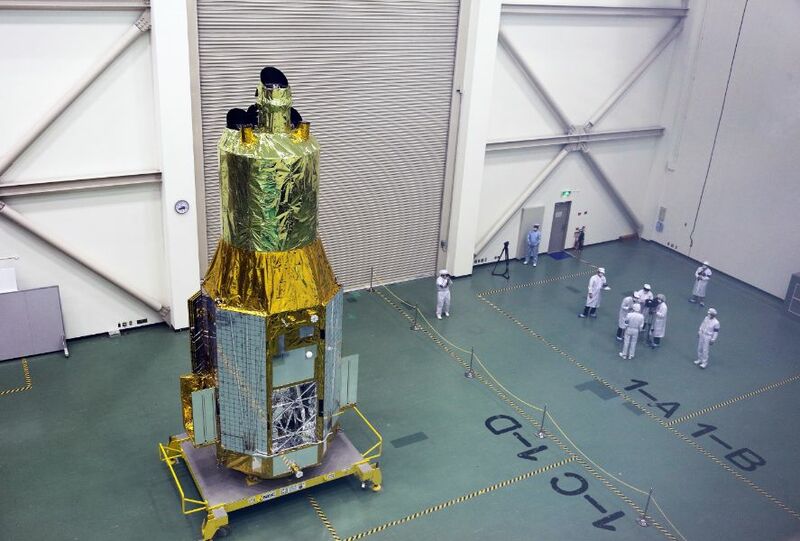 A Material Science experiment on the Horyu-4 satellite is known as Secret Ink, comprised of several different polymer materials that will be monitored over an extended period of time for an assessment of their degradation caused by atomic oxygen. The Photoelectron Current Measurement includes equipment for the generation of electrical spectra on a metal and isolator when illuminated by the sun. A CMOS camera installed on the satellite can deliver color photos of Earth to be used in space awareness campaigns and education.